Not many courses in Scotland can say they were designed by the same guy who laid out Augusta National – but Pitreavie can. 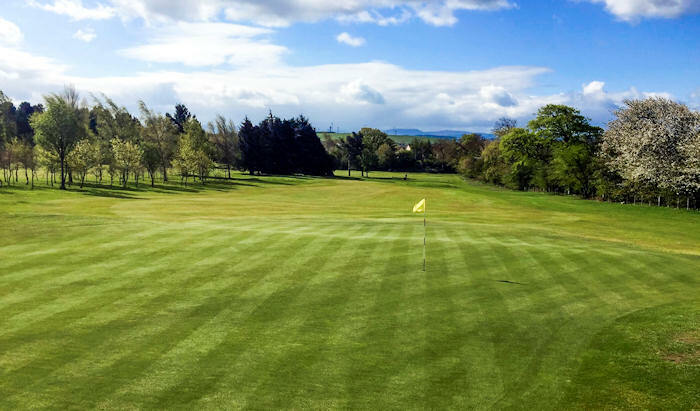 This exceptional Fife layout bears the hallmark of none other than Alister MacKenzie, and you’ll see that his input is evident as you make your way around the course. With an abundance of trees, burns, undulations, doglegs, blind shots and two and three-tiered greens – this course has it all. The course is a solid and fair test of golf for players of all standards. Course management is essential with many raised greens making it hard to accurately judge your distances and burns coming into play on no fewer than nine holes. A difficult finish demands that you leave something in reserve right until the very end. Your round at Pitreavie will be one to remember. Catering is available in the charming clubhouse, with the club offering all the amenities you could wish for. The 13th hole is lovely with a green surrounded by big mature oak trees. Book and play your golf within 4 days of booking and you can play this course for free. Book and play more than 4 days in advance and you must also book one of the mandatory packages below. Hire of a golf buggy for £25. Buy a £10 food voucher. Buy a £10 bar/drink voucher. Bring along an additional visitor playing at the same tee time for £20.